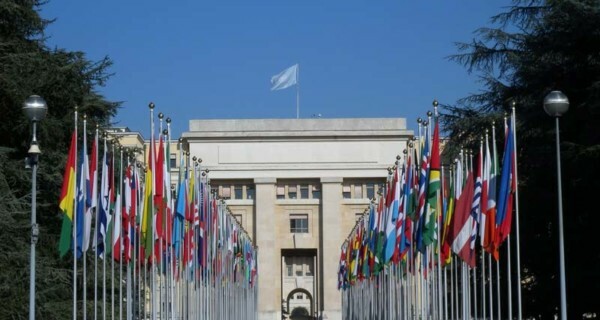 The Geneva Dialogue on Responsible Behaviour in Cyberspace aims to map the roles and responsibilities of states, industry and other key actors in contributing to greater security and stability in cyberspace in the context of international peace and security; identify good practices and possible gaps in existing efforts; and ideally put forward recommendations for overcoming such gaps. The dialogue aims to provide a platform in Geneva through which different stakeholders can engage in the discussions. The dialogue is led by the Swiss Federal Department of Foreign Affairs (FDFA) in cooperation with the Geneva Internet Platform (GIP), the United Nations Institute for Disarmament Research (UNIDIR), ETH Zurich, and the University of Lausanne. 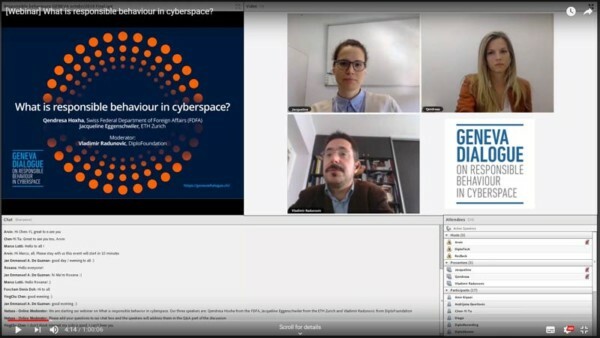 The Geneva Internet Platform organised a webinar titled ‘What is the role of the private sector towards a peaceful cyberspace?’ within the framework of the Geneva Dialogue on Responsible Behavior in Cyberspace. The webinar is the third in a series within the project, and reflected on what the role of the private sector is in ensuring international peace and security through responsible behaviour in cyberspace. Read the full report from the webinar here. The Geneva Internet Platform organised a webinar titled ‘What is the role of civil society and communities towards a peaceful cyberspace?’, within the framework of the Geneva Dialogue on Responsible Behaviour in Cyberspace. 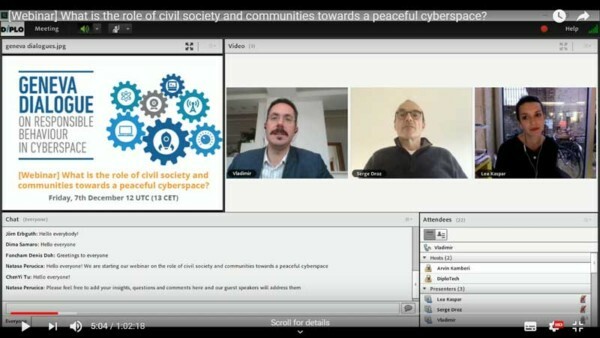 The webinar was held on 7 December 2018 at 13 CET (12 GMT) and it was second in a series of webinars within the project, reflecting on what the role of civil society, academia and technical communities is in ensuring international peace and security through responsible behaviour in cyberspace. Read the full report from the webinar here. The Geneva Dialogue on Responsible Behaviour in Cyberspace organised a two-day workshop in Geneva on 1 and 2 November 2018. Experts from various stakeholder groups participated in the workshop. 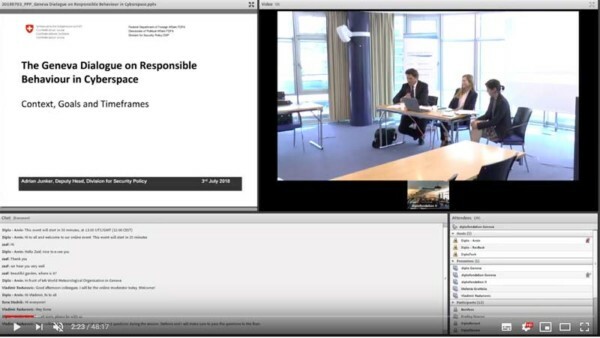 The Geneva Internet Platform organised a webinar titled ‘What is responsible behaviour in cyberspace?’ within the framework of the Geneva Dialogue on Responsible Behaviour in Cyberspace. The webinar was held on 25 October 2018 at 13 CEST (11 UTC) and was first in a series within the project, and reflected on what responsible behaviour means to various stakeholder groups. Do various stakeholders demonstrate a shared, or broadly similar understanding of ‘responsible behaviour’? Is ‘responsibility’ something to be regulated and enforced, or preferred and encouraged? Where there are differences in the understanding of ‘responsible behaviour’, are these differences of emphasis or of fundamental interpretation; are these differences compatible or incompatible? Read the full report from the webinar here. An information session about the Geneva Dialogue on Responsible Behaviour in Cyberspace was held on 3 July 2018. During the session, Mr Adrian Junker, Deputy Head, Division for Security Policy, FDFA, introduced the background, goals, and timeframes of the dialogue and explained how stakeholders can contribute to the process. Kavanagh, Camino and Daniel Stauffacher. A Role for Civil Society? ICTs, Norms and Confidence Building Measures in the Context of International Security. ICT4Peace Foundation, 2014. Smith, Michael, N. “In Defense of Due Diligence in Cyberspace” in 125 Yale L.J. F. 68, 2015. Kastelic, Andraz. “International Law of State Responsibility: Unlawful Orchestration Versus the Omission of the Duty to Prevent the Unlawful Cyber Operation,” In Compendium 2015:135-139. Centre for Security Cooperation (RACVIAC), 2015. G7 Declaration on responsible states behaviour in cyberspace. 2017. Group of 7 (G7). Establishment of a working group on cooperation and confidence-building measures in cyberspace. 2017. Organisation of American States (Inter-American Committee Against Terrorism – CICTE). Decision No.1106. initial set of OSCE confidence-building measures to reduce the risks of conflict stemming from the use of information and communication technologies. 2013. Organisation for Security and Cooperation in Europe. PC.DEC/1106. Decision No.1202. OSCE confidence-building measures to reduce the risks of conflict stemming from the use of information and communication technologies. 2016. Organisation for Security and Cooperation in Europe. PC.DEC/1202. Report of the Group of Governmental Experts on Developments in the Field of Information and Telecommunications in the Context of International Security. 2010. United Nations Group of Governmental Experts on Developments in the Field of Information and Telecommunications in the Context of International Security. A/65/201. Report of the Group of Governmental Experts on Developments in the Field of Information and Telecommunications in the Context of International Security. 2013. United Nations Group of Governmental Experts on Developments in the Field of Information and Telecommunications in the Context of International Security. A/68/98*. Report of the Group of Governmental Experts on Developments in the Field of Information and Telecommunications in the Context of International Security. United Nations Group of Governmental Experts on Developments in the Field of Information and Telecommunications in the Context of International Security. A/70/174. IoT Cybersecurity Alliance. 2017. AT&T, IBM, Nokia, Palo Alto Networks, Symantec and Trustonic. International Cybersecurity Norms. 2016. Microsoft. The need for a Digital Geneva Convention. 2017. Microsoft. Cybersecurity Tech Accord. 2018. Microsoft. Confidence-building measures in cyberspace. A multistakeholder approach for stability and security. 2014. Atlantic Council. Rights and responsibilities in cyberspace. Balancing the need for security and liberty. 2010. East-West Institute. Delhi communique on a GFCE global agenda for cyber capacity building. Global Forum on Cyber Expertise. Tallinn Manual on the international law applicable to cyber warfare. 2013. NATO Cooperative Cyber Defence Centre of Excellence. Risk and Responsibility in a Hyperconnected World. Pathways to Global Cyber Resilience. 2012. World Economic Forum. We invite all interested parties to participate in this dialogue by joining online discussions and sharing their views on the roles and responsibilities of the different actors in contributing to cybersecurity and stability in the context of international peace and security. If you are interested in contributing to the dialogue, we invite you to send your ideas and a brief description of the work your institution is currently undertaking related to responsible behaviour in cyberspace and international security and stability.